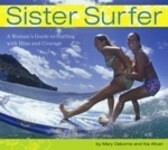 Learn to surf with professional surfer Mary Osborne! Mary and her surfing instructors specialize in youth and women-based classes. (Don’t worry guys you are always welcome). All abilities of surfers are encouraged to enroll, all campers will be taught the basics to the more advanced surfing skills. Come join Mary and her elite team in everyday surf instruction, spa and yoga retreats, as well as summer kid”s camps. It’s time to challenge yourself to learn how to surf, enjoy meeting new people, overcome your deepest fears, laugh, smile and most importantly, it’s time to have some fun! Come get wet! Champion longboarder and tandem surfer Mary Osborne is a classic triple threat. Most widely known for winning the longboard division of MTV’s reality show Surf Girls, the professional surfer and model is also making her mark as a television host, a television personality, and a business owner. Raised at Solimar Beach in Ventura, California, Mary picked up her first board at the age of fourteen.